Yes, and here’s the solution. Many cell phones broadcast in the 700-800MHz bands right in the middle of the broadcast TV spectrum. In many cases, this doesn’t cause any problem, but we’ve found that some users who are very close to cell towers have found it hard to get UHF channels. Until now, there hasn’t been a good solution. The antenna you see above you is the Boss Tech DAT-790 by Televes. It’s part of a whole line of high-quality antennas with LTE filtering technology. They work like our regular antennas, giving excellent long-range performance, but while they’re pulling in those weak and distant signals, they’re filtering out much stronger cell signals wherever they’re found. That means less interference and a clearer picture. Cell phones and emergency services use frequencies in the middle of the TV band, and while it would be great if they didn’t, they do so because they need the same long-range power and clarity that TV signals need. So it makes sense that they occupy the same space. When this decision was made, no one really envisioned it being a problem, but it turns out … that it kind of is. If you live near a large cell tower, if you use a microcell or even a powerful cell booster, if you live near a police station or hospital, you’re a really good candidate for our Televes antennas. We’re still taking pre-orders so you can be the first to get one when they come in. 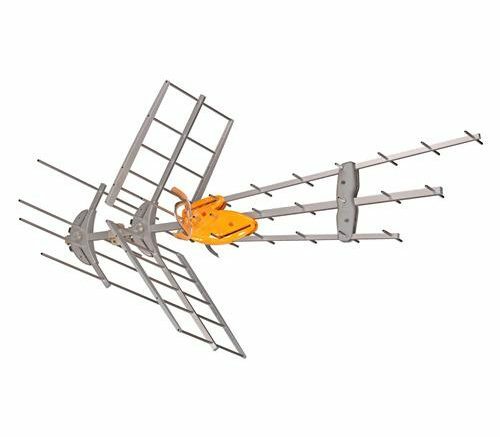 Just order now and you’ll find your UHF reception should improve if you were having problems with nearby broadcasts. Sometimes an amplifier’s not the answer. SOUND OFF SUNDAY: How much live TV do you watch?